It's official! One look at the appointment schedule tells us that summer has arrived. Diarrhea, anxiety, hot-spots, and torn toe nails! Here are just a few things to be aware of this summer to help keep your four legged kids safe and healthy. Yards and fences. Most of us choose to entertain outside when the weather is warm. But extra people in and out of the yard increases the risk for the gate being left open and, all of the sudden, Fluffy is nowhere to be seen. Either keep her indoors, or make very sure your guests are aware that the gate or door needs to remain closed. Pools and ponds. Swimming is great fun for the whole family. 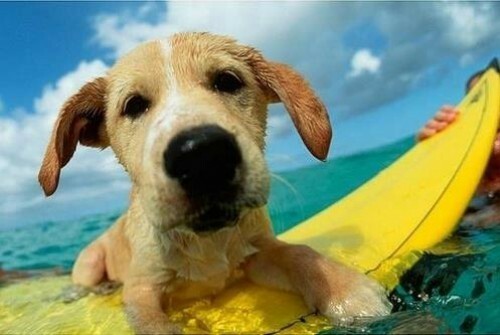 If a pool party is in progress, discourage your dog from getting in the pool. A crowded pool can contribute to a feeling of panic in the water and lead to bites or other accidents. Ponds are doggie heaven, but their murky waters can contain bacteria and parasites. Make sure your dog is up to date on vaccines and parasite prevention before jumping in. The water alone can be problematic for dogs prone to ear infections. Make sure to flush those ears out with a drying ear cleaner after Fido comes inside. Barbeque blues. Who doesn't love a good cookout? Bones, skewers, and corncobs are some items frequently found lodged in mouths and intestines of curious canines. Make sure you have plenty of trash cans at the ready (even better with locking lids!). Also make sure to inform your guests that, no matter how much he begs, Fido isn't to have any scraps. "Dietary indiscretion" is one of the leading causes of GI upset, leading to vomiting, diarrhea, and sometimes even pancreatitis. Don't forget the grill! Sure smells good, especially to Fluffy. Hot coals or gas burners can cause serious injury. Keep the dog inside until the grill is cooled. Fireworks. Talk about a party! But poor Fluffy is hiding under the table and even urinated in the corner! If your dog is nervous around loud noises or thunderstorms, you might want to leave the fireworks to the professionals elsewhere. If your home is near to a summer fireworks display, make sure your dog has a safe and quiet place to stay. If he becomes destructive or aggressive, consider asking your vet for a sedative. While glow-sticks can seem a safer alternative, consider the risk of Fido mistaking one for a chew toy. Fruit salad. Gosh, these grapes are tasty! Grapes and raisins are toxic to dogs. Apple cores, peach pits, and crab apples can all become lodged in the intestines. Macadamia nuts are also toxic to dogs. Keep it safe this summer so everyone can have a great time.